With over 494 MW of commissioned power capacity, Northern Virginia is the largest data center market in the United States. Over the last few years, this area has seen tremendous growth, spurred by business competition and its close proximity to Washington D.C. Recently, Digital Realty announced plans to expand their presence in Ashburn, indicating several key points about the conditions in Northern Virginia. 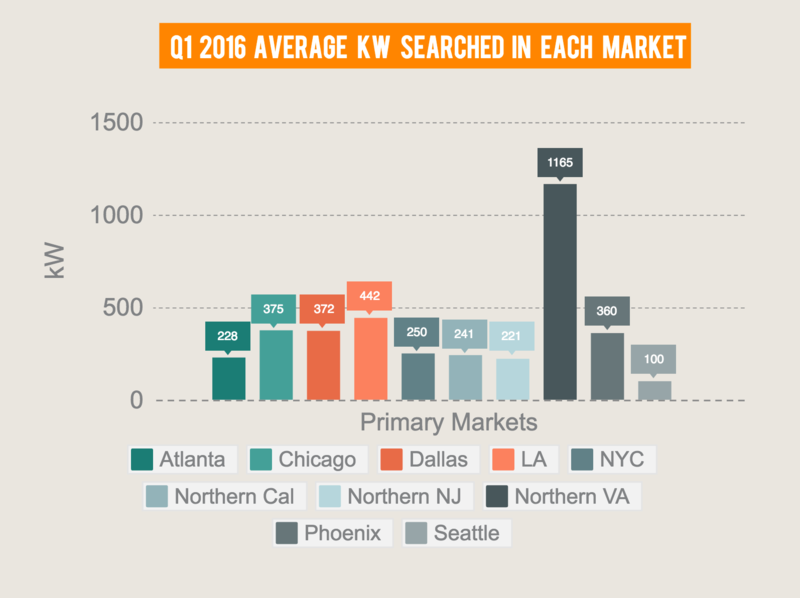 Northern Virginia quarterly absorption continues to increase with pre-leasing, creating a low vacancy rate of commissioned power. Earlier this year, Digital Realty announced the purchase of 126 acres of land within close proximity to their existing Ashburn campus. Digital anticipates delivering 150 MW of critical power when the campus is fully developed. This large expansion vision is predicated on the fact that data center user activity is growing – and will continue to. As an example of transaction size in Northern Virginia, we evaluated how data center users and consultants searched datacenterHawk in Q1 2016. Hawk Search allows data center users and consultants to evaluate data center markets by searching for available, under construction, and planned commissioned power coming to a market. Below are the results for Q1, which reveals data center professionals searched for the largest transaction size in Northern Virginia. This indicates the market is viewed, by those searching, as one capable of handling large data center requirements. While providers are currently expanding to increase market capacity, they are also improving the services offered at those facilities. This week, Digital Realty announced their plan to expand connectivity options and services in their existing and future Ashburn campuses. With the increasing demand for cloud solutions, managed services, and improved connectivity, data center providers are positioning themselves to serve customers more effectively by offering what their customers truly need. The Northern Virginia data center market is extremely competitive due to the past and continuing investments from large data center operators. Last October, Equinix broke ground on a new 45-acre campus which will add five additional facilities to their existing 10 facilities in the market. DuPont Fabros is currently working to deliver the third and fourth phases at their ACC7 facility. They have also purchased 44 acres in Ashburn, with plans to deliver two more data centers, as well as a 10 MW powered shell. They are currently under construction with ACC9, which will have 14.4 MW of commissioned power at full build. CyrusOne, a Texas based data center operator, is currently building a 230,000 square foot facility in Sterling for one end user, capable of 30 MW of capacity. Several other large data center operators are currently expanding in the market as well. The recent activity will only perpetuate the already consistent growth seen in the Northern Virginia market. Providers continue to expand their facilities and improve their solutions to stay competitive, making Northern Virginia the go-to market for companies looking to create a strong East Coast data center presence.